I do have to admit that it does feel rather ironic to be wearing an outfit inspired by the snow and ice in the midst of the summer! 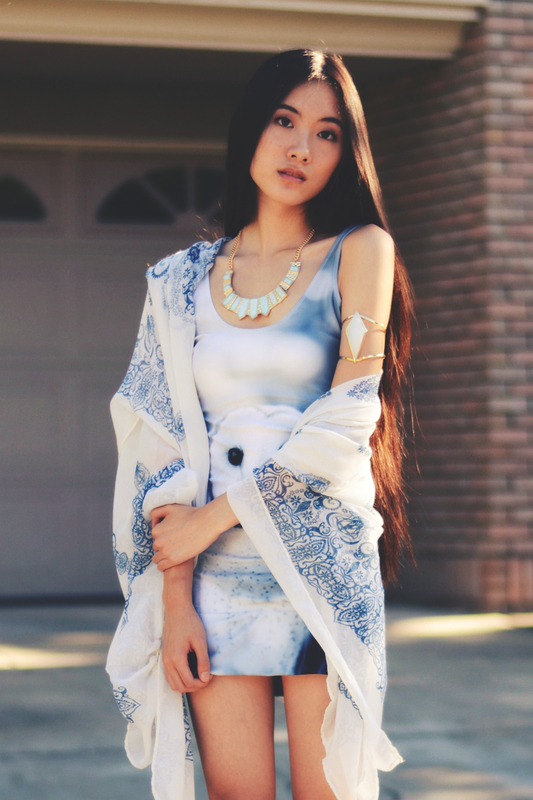 This snowy owl dress is one of my favorite pieces from Dreamachine Clothing; I love all the varying values of blue and the way that it matched perfectly with this scarf from IAnyWear. Scarves/shawls are really handy during the summer for creating the illusion of outerwear while still keeping your outfit light and airy. The finishing touches for this outfit were these goddess inspired jewelry pieces: an aurora stone necklace from ShopAKIRA, and a diamond gem cuff from 2020AVE. I love it!! The owl is too cute, and that bracelet is fantastic! I also really like the color scheme of your outfit, the cold colors are such a contrast with the summer's heat, I absolutely love it! Ahhh! Thank you so much! :D I love this comment! 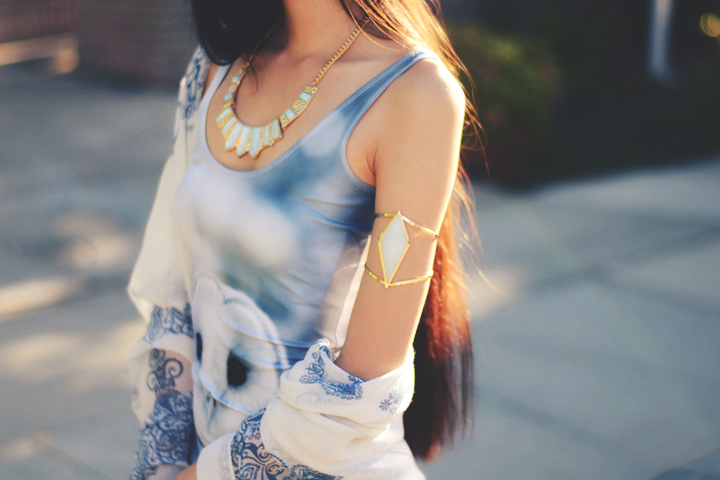 i love your arm cuff! and the colors of that outfit are really nice, remind me on the wide ocean! I fanned you in Lookbuk. Dear you are stunning! You have a very nice blog. I am following you now via GFC & Bloglovin. I hope you will follow me back, come see my blog now. See you there. Cool and gorgeous, so befitting of your title! Just beautiful! I love the owl printed dress! i am in love with this outfit! you look stunning. the choice of the owl dress and shrug shows your eclectic sense of style which i am a fan of! More outfit posts please! I wish to invite you all and hope you can join / support my ongoing giveaway from a new sponsor. Would really appreciate your support and participation! (^_^) Thanks a lot my dears! Wow, the dress are amazing, I love owls!